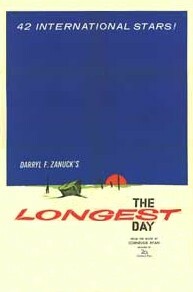 ''The Longest Day'' is filmed in the style of a docudrama. Beginning in the days leading up to D-Day, the film concentrates on events on both sides of the channel such as the Allies waiting for the break in the poor weather and the anticipation of the Axis forces defending northern France. The film pays particular attention to the decision by General Eisenhower, supreme commander of SHAEF, to go after reviewing the initial bad weather reports as well as the divisions within the Oberkommando des Heeres|German High Command on where an invasion might happen or what response to it should be. Numerous scenes document the early hours of 6 June when Allied airborne troops were sent in to take key locations. The French resistance is also shown reacting to the news that an invasion has started. ''The Longest Day'' chronicles most of the important events surrounding D-Day. From the British glider missions to secure Pegasus Bridge the counterattacks launched by American paratroopers scattered around Sainte-Mère-Église, the Operation Jedburgh|infiltration and sabotage work]conducted by the French resistance and Special Operations Executive agents, and the response by the ''Wehrmacht' to the invasion and the uncertainty to whether it was a feint in preparation for crossings. Operation Fortitude. Set piece scenes include the parachute drop into Sainte-Mère-Église, the advance inshore from the Normandy beaches, the US Ranger Assault Groups assault on the Pointe du Hoc, the attack on Ouistreham by Free French Forces and the strafing of the beaches by two lone ''Luftwaffe' pilots. The film concludes with a montage showing various Allied units consolidating their beachheads before the advance inland begins to liberate France.